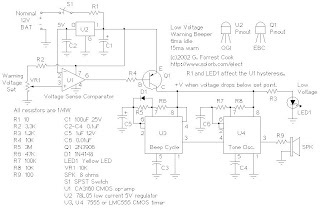 This electronic circuit is an alarm circuit for low battery condition. It provides an audible and visual low voltage warning for 12V battery powered devices. When the battery voltage is above the set point (typically 11V), the circuit is idle. If the battery voltage should fall below the set point, the LED will light and the speaker will emit a periodic beeping sound to warn of the impending loss of power. The circuit was designed for monitoring solar systems, but it could also be useful for automotive and other 12V applications. Connect the circuit to the 12V source that you wish to monitor. Turn S1 on, if the battery voltage is above the set point, nothing should happen.